Is The Brexit Mess Going To Tank The UK Markets? Amidst the government shutdown in the US and the destabilizing trade war with China, it’s easy to forget that the situation in the UK is not any more stable than it is here. The UK Parliament just voted down the current Brexit deal in a massive defeat for the government. In fact, it’s the biggest landslide defeat for the government in the last 100 years. It’s certainly not good news for investors in the UK who were hoping for stability, as it increases the chances of a haphazard exit from the EU. While it may give the government the opportunity to come up with a plan that the people actually desire, in the short-term it’s likely to add to the muddied Brexit picture. There are several areas which could be negatively impacted by an uncertain and disorderly Brexit. First off, the UK is a major hub for banking. Several US banks have key operations there and could be adversely impacted by the country’s “hard” departure from the EU. Of course, we can’t talk about Brexit without mentioned international trade. If the UK leaves the EU without a trade agreement in place, there could be significantly more tariffs paid on international goods. That could end up having a sizable impact on the economy. Higher taxes/tariffs on international goods may not have an immediate effect on the UK’s GDP, but over time, it could do real damage. Certainly, it could result in domestic job loss. It’s also likely to impact the standard of living. So how are UK stocks going to react to the potential for a disruptive Brexit? At least one big strategist is certainly concerned with (or possibly betting on) the downside. 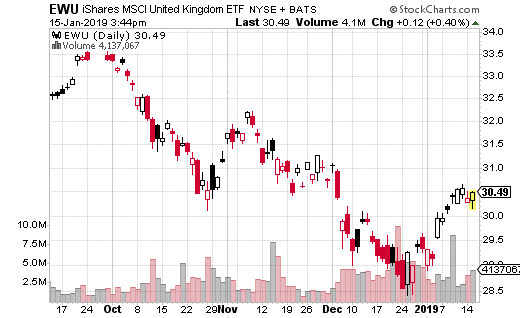 The trader made a very large trade in iShares MSCI United Kingdom ETF (NYSE: EWU). EWU is far and away the most popular ETF in the US for trading UK stocks. It has $1.8 billion in assets as of this writing. With EWU at $30.40, the trader purchased 50,000 February 15th 28-30 put spreads. That means the put spread buyer bought the 30 puts and sold the 28 puts at total of 50,000 times. The price paid was $0.47, which is also the max loss on the trade (and makes the breakeven point $29.53). Max gain occurs if EWU is below $28 at February expiration, which would be below recent lows during the big December selloff. In that case, the put spread would generate $1.53 per spread, or $7.7 million in profits. Max loss in dollar terms would be $2.4 million. This put spread is likely a hedge against long shares in UK stocks. It’s a short-term (only about a month), so whoever made this trade is concerned about the near-term downside, perhaps in the aftermath of the recent Brexit vote. I also don’t believe this is a speculative trade because the strategist still stands to lose $2.4 million if UK stocks don’t tank – which is a lot to cough up unless you own even more in stocks. Moreover, this trade can generate 325% in profits if UK stocks collapse. That makes it a reasonable put spread to place for anyone who has any exposure to the UK market or has concerns over Brexit. Market Crash 2019! Is Your Portfolio Protected? The stock market decline last fall is just a preview of what's to come and your portfolio will bear the brunt of it. The Fed is unwinding assets to the tune of $50 billion a month while simultaneously pursuing a rising interest rate policy already starting to contract the economy. Housing is plunging, car sales are slowing, companies are announcing plant closures almost on a daily basis. 78% of Americans live paycheck to paycheck and 60% of Americans have less than $500 in the bank... they're just one set-back away from disaster... like an expensive car repair, a minor hospital stay, or getting laid off from one of the factory closures. The credit that drove the last expansion is drying up fast and becoming expensive for those few who can still afford it. All of this will crush the market and could take your hard-earned money with it. Here's how to add a layer of protection to your portfolio. Do it today before it' too late. Click here.